I've had a lot of fun learning the quirks of Silverlight for WP7 devices, and after playing with some of the other WP7 Sudoku's out there, I'm very glad to have Sudoku done my way on my phone again. :) I'm even more psyched that I can share my app with others, as it's now Certified by Microsoft and available on the Windows Phone App Marketplace! 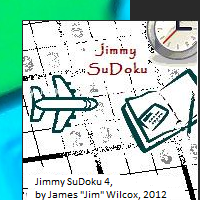 I have to admit... there's a lot of competition out there for Sudoku's on WP7 devices, and probably not a huge demand... I realize that for as much fun as I had polishing this app, probably the best way to find its value is to "give it away". So my family & I considered some options and decided on a national organization that helps feed under-fed/malnourished children here in the US. I thought it was a fitting thing... building software is my strength, and this is a way I can share it. I also can think back to some exceptionally lean times when I was a kid... memories I'd love to help avert for others if any way possible. So, yes, all proceeds from paid downloads will be donated to that cause. I finally had a chance to re-do the old .NET 2.5 Compact Framework-based app as a Silverlight 4 app for Windows Phone. I've been toying with this release for months (since November 2011, actually... I pulled down Visual Studio Express 2010 for Windows Phones around then, anyway). You can also click here on just about any device to get to the Marketplace site. Anything you can do to help is appreciated!